Couture Landscapes has years of extensive hands-on experience in designing and building retaining walls in Oakville and the neighboring areas. A retaining wall is meant to hold back soil, especially when there is a drop in elevation. It is simple, inexpensive and offers an elegant appeal while contributing to its basic function. Our expert landscapers in Oakville are fully-equipped with the right set of skills, tools and equipment to ensure the timely completion of your project. 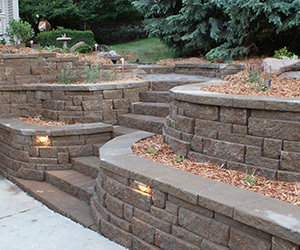 A retaining wall can quickly transform the look of your outdoor living space. Whether it’s for aesthetic purposes or to confine soil – we can construct something that fits the look of your home. Over the years, our expert landscapers have acquired a vast amount of technical expertise that is used in the designing and construction phase. Based on the characteristics of your existing landscape and outdoor living area, we can complement them with retaining walls made from concrete, wood, stone or even bricks. If superior strength, durability and resistance to pressure are required, we can build cantilevered retaining walls. These are special types of constructions that use steel supports to hold the retainer, improving its overall effectiveness. A retaining wall is a simple and elegant element of landscaping, providing an inexpensive way to control sloped areas, staircases or areas of varying elevations. Avoid the digging, excavation and landscaping costs of a contractor and choose Couture Landscapes to build you a beautiful retaining wall. Couture Landscapes is fully licensed and carries years of experience in all types of residential landscaping. With an excellent track record for offering the best in quality, reliability and strength – we will only deliver the best! Our commitment to offer the best value for money comes from our ability to obtain industry standard materials at competitive prices, ensuring the lowest cost for our customers. © 2019 Couture Landscapes - All Rights Reserved. Website by Hayes Web.